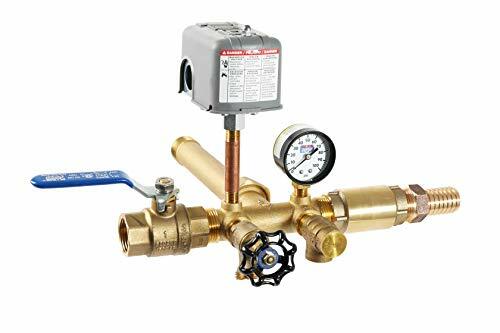 SPECIFICATIONS - Includes check valve (1" FPT), shut-off valve (1" FPT), 1" NPTM x 1" Barb, Boiler Drain (½" MPT), pressure relief valve, preset at 100psi (½" MPT), Riser (1/4" x 3" MPT), Pressure Gauge (¼" MPT), and 40/60 PSI Pressure Switch. UNION INCLUDED - This tank tee package comes brand new and includes a Union (1" FPT). SOLID BRASS - You will not find any lead in this tank tee package as it has been made with a solid brass construction. FEATURES - Threaded connections on inlets and outlets. This is a genuine product manufactured by Boshart Industries. BONUS - For no extra cost, a roll of teflon tape is included in this package. If you have any questions about this product by Boshart, contact us by completing and submitting the form below. If you are looking for a specif part number, please include it with your message.